George Allen, born in 1820, and Anna Shan, born in 1831, were the parents of Alex Allen. They were from Seclusival, Shipman, Nelson, Virginia, located just west of Tye River and Gladstone, on the western edge of Findley's Mountain. Grandma Carlie's list of family names. 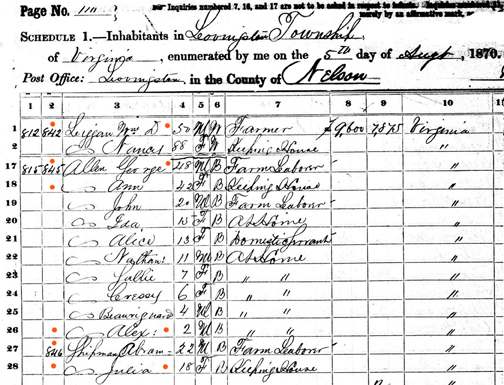 Anna Shan was a very fair-skin "Mulatto" and appears on the 1850 census. Our family pronounced her last name as "Zan". Anna, was originally a servant Robert Rives (1764 -1845) of the Oak Ridge Estate,Plantation. She later became a house keeper for William D. Ligon. Here is the receipt of a coffin purchase made by John "Dock" Spinner, born 1851, son inlaw of Anna Shan. Anna's daughter Alice Allen, born 1857, was the wife of Dock Spinner. Anna Shan is buried at the Oak Ridge Plantation owned Robert Rives. 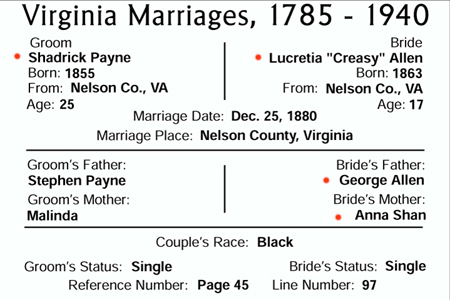 George Allen (son of Sampson Allen, born 1805, and Paulina Branch, born 1808), were slaves of the "Ligon" family of Shipman, Nelson, VA.
George Allen had 4 siblings. They were Scott, Stephen, Joseph and William. 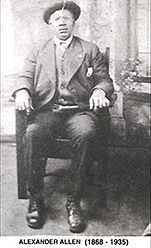 Scott Allen, born about 1839, was sent to work as a farm laborer of one of the children of William Massie (owner of the (Pharsalia Plantation) in Massies Mill, along with Ellen Payne, born 1850, who married Dandridge Mead. 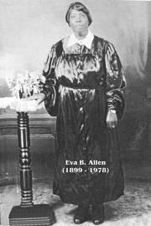 Ellen was the sister of Creasy Allen's husband Shadrick Payne. 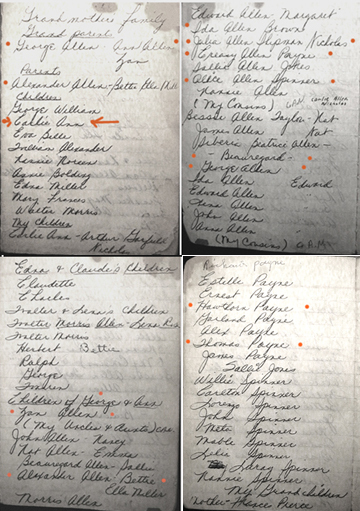 Creasy Allen is shown on grandma Carlie's list of family names. Dandridge Mead (e,s) was the son of Thomas Meade. (See "Mead / Meade / Meades" family line). The brother of Thomas, was Solomon Meade, who's son Reubin Mead (e,s), was a slave of William Massie and Catherine Dodd Effinger's daughter, Martha Virginia Massie. Martha married, Joseph Fleetwood Ligon. 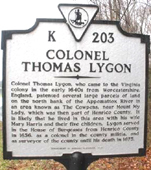 The brother of Joseph Fleetwood's 2nd great grandfather Richard Ligon, was William Ligon. 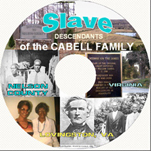 And William was the great grandfather of William Daniel Ligon, Jr., (slave owner of George Allen). Here is a hand-written letter to grandma Carlie, from her father Alex Allen, back in 1924. John W., Julia, Alice, Nathaniel, Ida, Sallie, Edward, Lucretia "Creasy", Beauregard, Alexander "Alex", and Nannie.